Thanks to George and Sandra Pritchard for this transcript. This is a transcript done by one person and will, inevitably contain errors. Researchers are always advised to consult the original source. The Sennen War Memorial, which is surmounted by a great Wheel Cross. The names recorded here are Geoffrey H. Coles, Hosea George, Richard T. George, William H. George, John Hollow, Harry Hosken, John H[arry] Lucas, Arthur W. Parsons, Mathew G. Penrose, [William] James Rapson and James Symes. 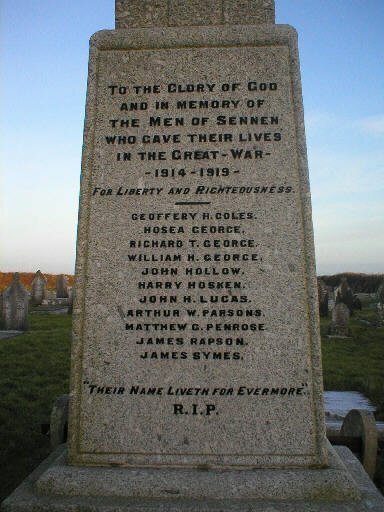 Nicholas, Benjamin Pender, Samuel L.
The reverse of the Sennen War Memorial. 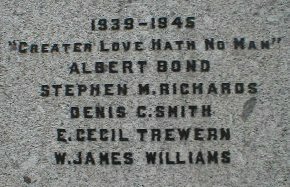 The names recorded here are Albert Bond, Stephen M. Richards, Denis C. Smith, E. Cecil Trewern and W. James Williams. Peek, A. Dawn De L.